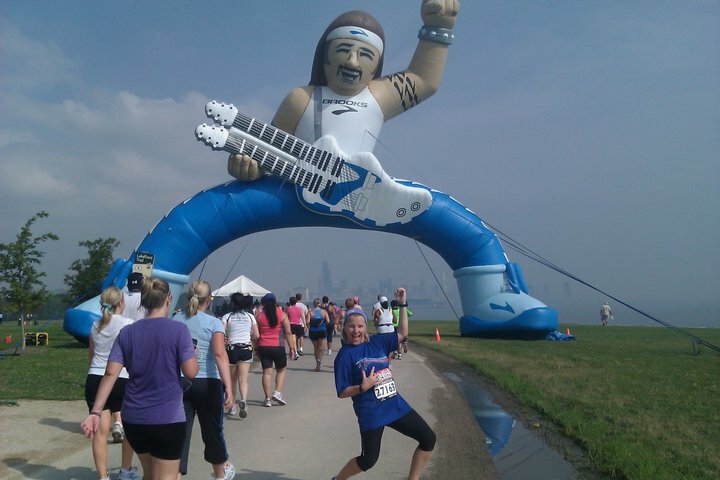 memories for everyone: Chicago Half Marathon was TODAY! Chicago Half Marathon was TODAY! I did the Chicago Rock n Roll Half Marathon with Neil this year. He usually runs it a lot faster than I do... but he has a knee injury. So, we ran about three miles and had to walk the rest due to the extreme pain in his knee. It was nice just hanging out with him for that long, and we were walking at a slower than normal pace, so it felt nice. I even took pictures with my new (I LOVE IT) mytouch phone and posted to FACEBOOK if you can believe it. Last week I had never used facebook and only had a very old RAZR phone.... and here I was today, posting on facebook from my phone while walking/running 13.1 miles. Go Me! :) Also... here are three fun pictures that we had taken at a booth at the health fair we went to yesterday in Chicago!